While Houston’s sprawl may be knocking on Conroe’s door, don’t make the mistake of lumping this town in with the masses. Its distinctive blend of Piney Woods beauty, lakeside fun, and rich history make it well worth the highway exit. Contact the Conroe Convention & Visitors Bureau at 936-522-3500; playinconroe.com. Editor’s note: Check texashighways.com for updates on the reopening of Conroe restaurants and attractions following Hurricane Harvey. 9 a.m.: Epic day trips require epic breakfasts, so I headed to The Toasted Yolk Cafe, which specializes in putting a new spin on our most important meal. I ordered the Southwest Arnold—this cafe’s take on the classic eggs Benedict. It came served with poached eggs on the familiar English muffin but with new toppings like sausage, onions, and jalapeños. And instead of hollandaise sauce, it was smothered in Texas-style queso—the perfect fuel for the adventures to come. 10 a.m.: This part of Texas (specifically Montgomery County) is credited as the birthplace of the Lone Star flag. To learn more, I headed to the Lone Star Monument and Historical Flag Park, where 13 flags fly high and offer a history lesson about the symbols of Texas’ revolution and republic periods. Displays showcase the 1824 tri-color flag that many believe flew at the Alamo, the “Come and Take It” flag of Gonzales, and even a little-known flag with a gold star that served as the second flag of Texas. Of course, nothing tops our iconic Lone Star flag created by local pharamacist Dr. Charles B. Stewart in 1839 and adopted as the official state flag in 1845. I was so inspired I broke into the Texas pledge. 11 a.m.: Down the street, I dove even deeper into the history books with a visit to the Heritage Museum of Montgomery County. From lumberyards to cotton fields, I learned all about the pioneers who shaped Conroe into what it is today. I learned that Texas once produced cigars so good they won the world fair. Oh the stories you can discover in small-town museums. noon: I cruised through downtown, surprised by the number of shops open for business with everything from coffee to fashion to live music. I stopped into the Red Brick Tavern for lunch and found it packed with business folk and tourists alike. I sat next to the small stage and ordered the “Ring of Fire” pizza that came straight from a wood-fired oven and was topped with andouille sausage, chorizo, and serrano peppers. I soon had no choice but to order a cold craft beer to extinguish the ring of fire in my mouth. 1 p.m.: Ready to head outdoors, I pointed my compass toward Lake Conroe just west of town. Surrounded by the Piney Woods, this lake offers trippers a singular mix of East Texas charm and fun in the sun. I jumped in and spent some time relaxing on the beaches of Lake Conroe Park. However I soon craved a bit more action. 3 p.m.: Luckily, just up the banks, I found Hydro Rockets helping folks learn one of the newest, hottest water sports. 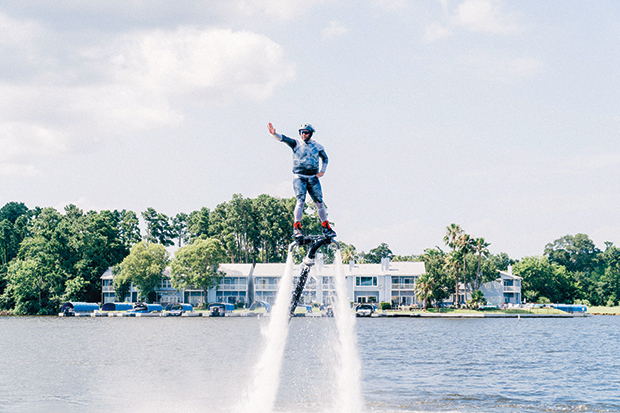 It’s called “flyboarding,” and using the power of a jet ski to direct water out of a tethered board, it helps folks “fly” through the air. They hooked the water rockets to my feet and before I knew it, I catapulted 15 feet above the water. I definitely did a few face plants during the learning curve, but as soon as I found my new water-thrusting legs, I soared over the water like a real spaceman. Maybe humans can fly. 6 p.m.: After an afternoon spent on the lake, I was in the mood for fish. Rather than catch my own, I decided to visit the experts at Vernon’s Kuntry Katfish. What started as a small gas station on a forgotten highway has evolved over the decades into a Texas-size institution serving its signature fried fare. Inside the cozy dining room, I felt like I had been invited to the family dinner table as I bellied up to my plate of fried catfish, frog legs, and hush puppies. Conroe is both a refreshing dip in the lake and a deep dive into some of Texas’ most important history. So whether you follow my footsteps or forge your own path, I hope to see you on the road.